Green tea ice cream is probably my all time favorite dessert. I love the balance of sweet, bitter, and depth. I love that it's not overpowering overly sweet. 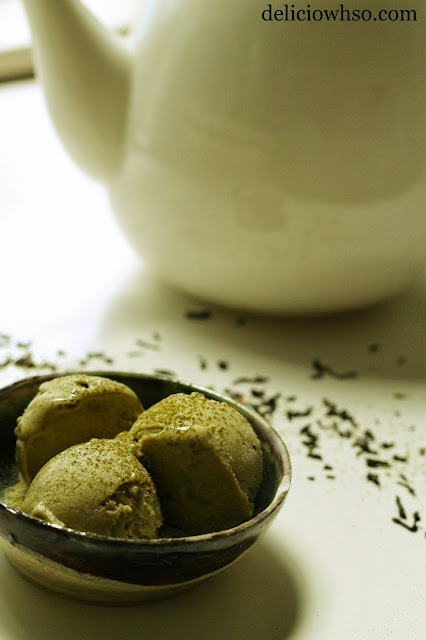 I made it a goal to make green tea ice cream at some point, but I hadn't been able to until recently. It takes a little time and a bit of extra preparation, but it is well worth the work. It is often difficult to find a really good green tea ice cream, especially in Providence, RI, where I am going to school. I figured my best bet for a good green tea ice cream would be if I made it myself and flavored it according to my preferences and tastes. It was so exciting to make one of my favorite flavors, that I had to share with everyone who follows the blog. So take a look and see how to recreate this delicious ice cream! 1. Prepare your ice cream machine as the instructions direct (for mine, i have to put the vessel for the mix into the freezer overnight). 2. In a medium sized bowl, make a paste with your matcha powder by adding about a tablespoon of water. 3. Heat your milk, cream, and half of your sugar in a pot over medium-high heat. 4. In a large bowl, mix the egg yolks and remaining sugar together. 5. When your milk and cream boils, turn off heat, and pour about a third into the matcha paste and incorporate. Try to mix out any lumps. 6. Pour the matcha mixture back into the pot. 7. Pour the hot milk mixture into the yolks, whisking as you gradually pour. 8. Pour the egg mixture back into the pot and heat on low-medium heat while mixing until it thickens slightly. For this sized batch, it will thicken very quickly! Be careful not to overcook because the egg yolk will curdle leaving a eggy flavor and a grainy mouthfeel. 9. Turn off the heat when the mixture sticks to the back of the spoon. You can check this by running your finger along the back of the spoon. A line where your finger passes should hold shape. 10. Pour the mixture through a fine strainer into a bowl over an ice-water bath. To make an ice-water bath, fill a bowl with ice and a little bit of water, then put a smaller bowl over the ice. 11. When cooled completely, pour into your ice cream maker and follow the manufacturer's instructions to churn. 12. Place into the freezer for at least a few hours to harden before serving. 13. Scoop into the desired bowl (freeze the bowl to keep the ice cream frozen! 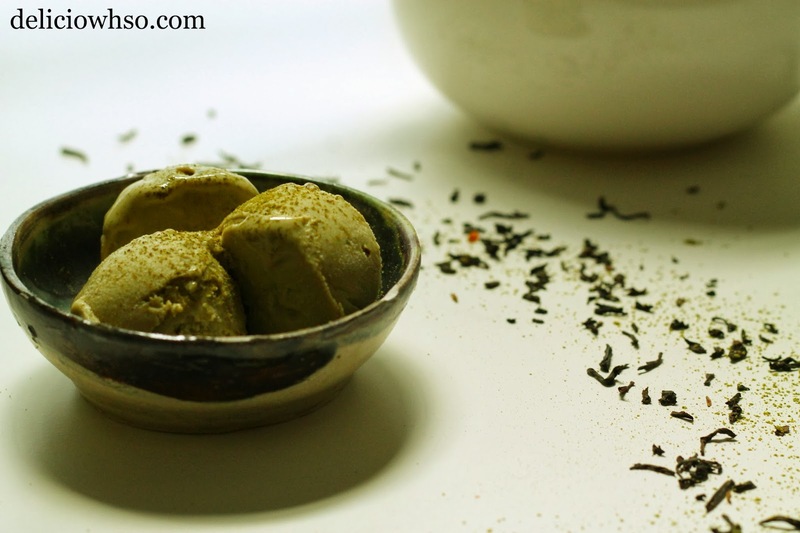 ), sprinkle with matcha powder and serve. Even though the summer season is ending, keep expecting more ice cream posts! You can have ice cream in any season! ;) Comment with any ice cream/sorbet flavor suggestions! hey where do you buy the matcha powder? I live in atlanta and I can't find it at any of the asian markets! all rights reserved ©deliciowhso ©2013. Powered by Blogger.